located at a distance of just 2 km from the Chengannur bazaar. It is of great historical significance as according to the legends the chief characters of the Indian epic Mahabharata- Pandavas, along with their wife Draupadi stayed in the forests of this region. There is a pool of water at this place, which never dries up. The scenic sight of Chengannur can be viewed from this place along with a breathtaking view of green valleys and fields. 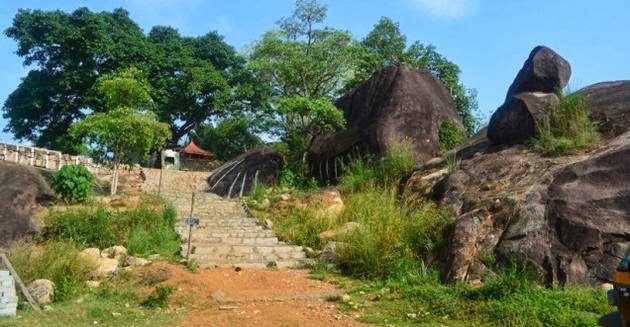 Pandavanpara comprises of a group of rocks that are believed to have been used by Pandavas during their exile period. These rocks are situated at a distance of about 2 km from Chengannur town, in Alappuzha District of the southern state of Kerala. The place also has a temple that is dedicated to Lord Krishna. The three rocks behind this temple show lotus in various stages of bloom, like the first one shows bud, the second one shows half bloom and the third one shows the full bloom. The other rocks in this area include the one shaped like a frog with its mouth open, a rock that produces musical vibration, a chair case of betel leaves and arceneut. Among the rocks, the unique one is that of a rock in the shape of a giant body, which is said to have been reclined by Bhima, one of the Pandava brothers. A giant footprint of Bhima can be seen on this rock. The place also has five rocks in the shape of chair, believed to have been utilized by the Pandava brothers. The temple of this place has been recently renovation with the help of the donations from members of different communities and faiths. There is also a small shrine located at this place, dedicated to Nattudaya swami, who is considered to be the guardian of the area. Chengannur town is a scenic town dotted with lush green vegetation of banana and coconut, located in the extreme east of Allappuzha district of Kerala. The town is situated at a distance of about 117 km to the north of Thiruvananthapuram, the capital of the state. It is considered as one of the increasingly developing towns in Kerala. The town is of great historical importance as in the past it was a busy business center. The town is a significant pilgrimage site of the Sabarimala and the holy river Pampa flows through this town. The town has several tourist attractions involving temples and churches. Among these, the Bhagwaty temple of Chengannur is one of the most popular one among the pilgrims. By Road: The site can be easily accessible from Chengannur town, which is located at a distance of about 2 km. The town has a decent road connection to Thiruvananthapuram, located at a distance of about 115 km. Other major places close to this town are Kottayam (38 km), Thiruvalla (10 km) and Kollam (70 km). By Air: The nearest airports to this site are Kochi airport, at 97 km away and Thiruvananthapuram airport, at 115 km from Chengannur town. Buy Rail: The site is well connected through rail with Chengannur railway station that lies on the railway lines linking Ernakulam and Thiruvananthapuram, as well as Kochi and Thiruvananthapuram. Regular trains travel on these routes.